A policeman with a sideline as a gangster involved in prostitution and drugs was brought to justice after driving a £170,000 Ferrari to work. Osman Iqbal, who was an officer based in Birmingham, was jailed in September for seven years for running a brothel. Iqbal, 37, whose crimes can only now be reported in full for the first time, was in court again on Wednesday, when he admitted three misconduct offences. Ch Insp Martin Brennan said Iqbal's "greed had been his downfall". 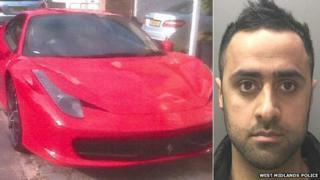 The crooked policeman's double life as a gangster was unveiled as a result of his decision to drive the Ferrari to Kings Heath police station. Colleagues became suspicious and West Midlands Police's counter-corruption unit began investigating. Officers discovered Iqbal, from Ward End, had bank accounts for two non-existent businesses that were being used to launder "hundreds of thousands of pounds" from brothels in the Covent Garden and Marylebone areas of London. During their investigations, detectives also found Iqbal had attempted to access police intelligence systems. Iqbal was asked by Nahiem Ajmal, a Birmingham religious leader, to obtain information on behalf of Sajad Khan, West Midlands Police said. It was for these crimes that Iqbal appeared in court on Wednesday, admitting three counts of misconduct in public office. Ajmal and Khan were both convicted of the same offence. The lifting of restrictions means it can now be reported that Iqbal is already serving a seven-year sentence. He was jailed in September along with other gang members after admitting conspiracy to run a brothel, conspiracy to launder money and possession of Class A drugs with intent to supply. Ch Insp Brennan, from the serious and organised crime unit, said: "Their greed was their downfall and when they were seen driving around in their supercars it didn't take us long to piece together exactly what they were up to and take action." Insp Tracey McGrath said: "Occasionally there are people who disgracefully betray the public and even their own colleagues by exploiting their status for their own gain. "Let me reassure people that my counter-corruption team are on to people like Iqbal and there's nowhere for them to hide.